For decades, Myrtle Beach has been one of the nation's most popular golf des tinations, and it's easy to see why. 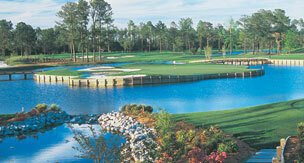 The fact that there are over 100 courses up and down the Grand Strand is in itself impressive. But, thanks to a surprisingly diverse topography and a wide variety of unique coastal settings, each course offers its own rendition of beautiful scenery and challenging play. Just be assured that whichever course you choose is likely to exceed your expectations! At Regency Towers you have the opportunity to combine championship golf with an unparalleled resort experience. Call us toll free at (800) 494-5055 and allow us to match your superior accommodations with a truly memorable golf experience.